My complain about Ricoh-Imaging using stock images for their advertising of lower end products like the WG-SERIES. To Let customers believe that the camera could be capable of taking such kind of images and reaching such high image quality. Wich I found deceiving. So now there is a new thing with Huawei using slr stock images to show that their new high end smartphone the P30 is such a great photografic tool. That is deceiving and should be condempt. Huawei P30 and that is happening. So I was thinking, is Ricoh-Imaging still doing this? And the answer is yes and no! Yes they still use stock images in their advertising images......but with the subtitel that these impression are *Image is concept art and not a real photographe taken with the camera involved (WG-6). So this is a good step in the right direction.....and proofs that I was right! At that size, it doesn't really matter what sensor size was used to take the photo. Using stock images is a time saver for the media editing person, at the time they edit the web page they aren't going to jump out of office and go out paddle on a river to get a shot to post in the website. That doesn't mean, at that magnification, the same looking image can't be taken with a WG6. In fact, sensors sizes is only a matter of display magnification capability and subject isolation. 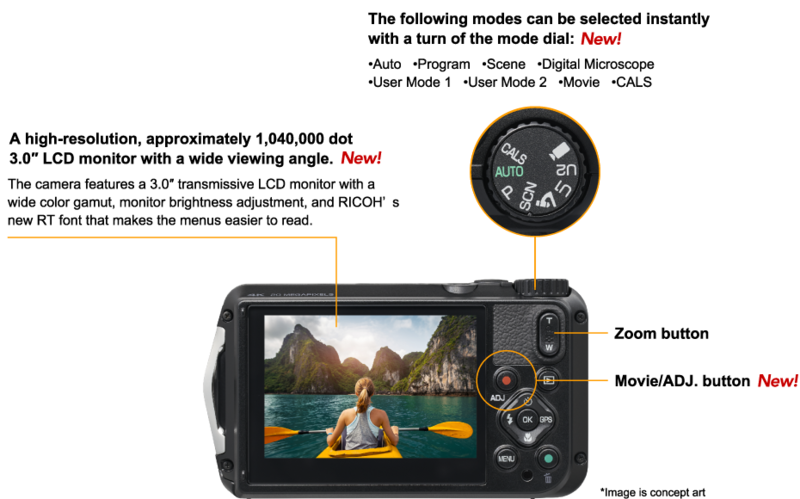 And a larger sensor isn't always better , it depends... For example, for hand held shooting is low light, medium format is a pain, compact cameras with sensor stabilization will do a better job with a wider lens aperture and smaller sensor. Where I live (Virginia), that's illegal for two reasons: first, any visual representation constitutes a warranty that the device will peform according to the picture, and warranties are cumulative (so even if they use a disclaimer, that has no effect on the fact that they used the picture to represent a quality of the device - it doesn't have anything to do with deceptive advertising, it's a contractual promise that the device will perform). And secondly, to the extent that it is deceptive, misleading, or fraudulent, that's a violation of the local consumer protection act, which provides a minimum of $500 in damages "just 'cuz", plus attorneys' fees, costs, and interest on the judgment amount. So is the complaint that the camera didn't take the image, or that the camera couldn't have taken the image? Didn't take the image is pretty easy to prove. Couldn't have taken the image is a whole different allegation. The problem being, I have several images that I took with older equipment i would seriously like to reshoot. But I can't get the light etc. as good as it was in the original image, (not uncommon for landscape artists). So, I actually can't take an image with a K-1 as good as one I already took with a K-5. SO would it be illegal for me to post that original K-5 image, because of the low odds of a consumer getting that image? Maybe any professionally taken image is misleading if you are selling to amateurs. This seems to me like splitting hairs. Advertising is advertising. If you don't understand they are paid to make a product look better than it actually is, in most circumstances, you shouldn't even be allowed to look at advertising. Last edited by normhead; 03-16-2019 at 06:51 AM. Well, your point is well taken, but since the image is shown as the purported LCD display and not a finished image, then cutting in a photo rather than trying to show the actual LCD display is essentially just a practicality for the ad agency. The disclaimer fundamentally acknowledges that. This is interesting. How do MacDonald's and all the others using photographs of food even exist in Virginia? Certainly, Mickey-D never served a Big Mac that looked anything like what you would see in an ad. On the other hand, I have many images that should never have come from a camera as fine as my K-3II. Let's not talk about those, or any of the majority of my images which are deleted after a 3 second glance, because they aren't worth more than an 3 second evaluation. Sometimes the concept you had in your mind when you took an image just doesn't show up in what you actually capture. I remember what I was thinking when I snapped the image, I just don't see it in what's on my computer screen. If you don't understand they are paid to make a product look better than it actually is, in most circumstances, you shouldn't even be allowed to look at advertising. I'm not entirely sure they want to make a product look better than it actually is. The job of marketing communication is to convey the right message, from my point of view they have chosen the picture on the kayak that communicate about what the WG6 is used for. Should they have displayed a picture of a street photo taken with a WG6 when in fact street photo is what the GR is aimed at? For PR using the right kind of picture is more important than what camera was used to take the picture. I'm not entirely sure they want to make a product look better than it actually is. From a marketing perspective, you show the product in it's best light being used by the best looking most famous models you can afford. Just by definition, if you show a product at it's absolute best, you are ignoring all the areas of weakness. No marketer takes a WG camera and shows a sunset that show's it's lack of Dynamic range. They show an image like the above, which looks like something I'd be using a WG for. It may be concept art, but there's no reason this image on the back screen couldn't have been taken with a WG. Look at my avatar for a real backscreen image. Getting the lighting right with a WG out doors would be near impossible. The back screen would have to match the intensity of out door lighting. When they say image do they mean the scene on the LCD screen part or the entirety of the camera. That's unclear. One could argue the image distorts the grippiness of the camera. The camera is clearly lit from above and behind where the camera and the viewfinder clearly shows the sun low in front. I'm not sure why that would be even marginally important. Kind of like knowing ice always used to be retouched into whiskey shots, because ice does't last long under the studio lights of yesteryear. That one clearly falls under the category of studio know how, rather than a "problem." The point being until we know what is being represented how do we know if it's misrepresented. Even then is a misrepresentation misleading? Even if Pentax has an ad of a giant putting a k1 in its pocket is that an ad that a k1 is a pocket camera? The original post is if a complaint is justified. What is misrepresented and why is or isn't that a reasonable assumption for the average person. The thing is that making an image is the basic function why people buy a camera. So you do like to know what to expect from this device when it comes to making images. So if you make the camera looking better in the way that expectations about the image quality coming from the camera are unrealistic......Well then be prepared to have only disappointed customers after their purchase. To me on my phone it looks like a game graphic. So to me it only represents being on the water with a camera. Would the average person think that represents what you will get? If it does they will lose more customers who don't want a game rendered image anyway. Now in the ricoh site that picture of the mountain in snow appears to be an actual picture from the camera. That to me better represent actual achievable results.